You've whooshed through another week, halfway through the year! I hope you have a wonderful weekend with a bit of time for getting crafty! 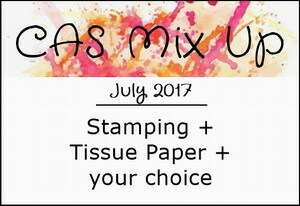 Last week I saw that the CAS Mix Up Card Challenge wanted us to play with tissue paper and to be honest, I thought, nah, I've got so many things on my "Try This!" list, I'll just pass on this one. Then I saw Loll's Video and I couldn't wait to give it a try! I made a large panel from the tissue paper with the DI colors you see and then I cut that into four smaller sections to make four cards. For the card above, I added dimension with MFT frame dies. 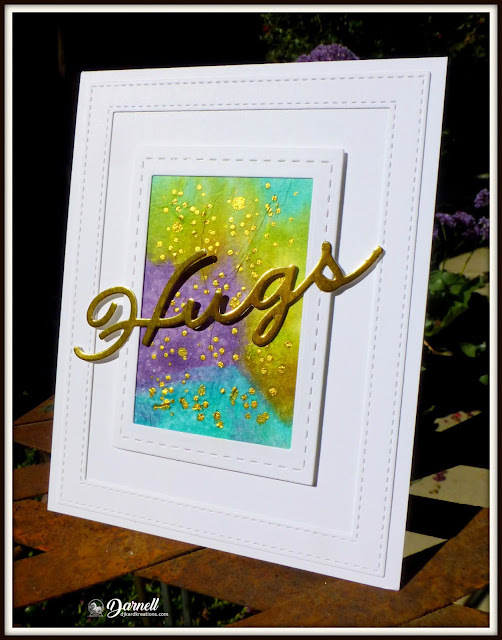 Loll showed how beautiful gold looks on the tissue paper, so I added lots (and lots) o' dots using Delicata "Golden Glitz" and overlaid both frames with a gold Hugs sediment. I decided to use another piece of the tissue art as a landing strip for a dragonfly. To add more pahjazzle, I used the negative of the dragonfly die as a stencil and sponged random dragonflies in the same colors I used for the tissue paper smooching. Then I embossed the panel (which is glossy) with a Sizzix e/f. You can see I used a brad. Brads haven't been used much since Brad dated Jen, but I still have some and I'm not afraid to use them now and again. As I was pulling out various paper options for what to partner with the tissue paper, I came across some gorgeous gold-embossed acetate sheets from (I think) SU which, natch, have never used. And I veered off the tissue paper course, but stuck with the gold. I measured the acetate sheet and laid out the design. I stabbed two holes in the acetate where I wanted the gold brads to be. Then I lined everything up again and stabbed two holes in the gold panel. Using the brads, I then impaled the butterfly to the acetate and then to the gold panel. Then I adhered the gold panel (with everything stuck to it) to the card base with foam tape. It took me longer to type that, than it did to make it! I thought at first that the card was schparkly enough without a sediment, but the more I glanced at it across the room, the more Hammy changed my mind, especially when I thought of this Impression Obsession die. I die-cut it from adhesive gold paper and slapped it onto the acetate. I now return you to your regular scheduled programming. The children can return to the room. All of them are absolutely stunning, but the dragonfly one is the stunningest. But I'm a total sucker for anything dragonfly related, so I had to think that, didn't I? Excellent way of attaching the acetate to your card. I find I rarely use acetate or vellum because they both have attachment problems, and since they refuse to go into therapy we're stuck when it comes to sticking them. Love the first one themes !!!!! Great work with the tissue paper and a bit of glitz never goes amiss. I'm sure no butterflies or dragonflies were harmed as they say!! Three gorgeous cards Darnell your dragonfly card is really eye catching ...I don't use acetate very often but like how you've attached yours. Great cards! Love that tissue-technique and the gold looks so elegant! You slowly must get less paper; you find so many ways to use it... Hope you have a fun weekend! All this wonderful gold just makes my heart happy Darnell, what a collection of inspiration! A whole lot of pretty going on in your neck of the woods. Great job using that technique encouraged by Loll. Even in you veered off course the golden butterfly is beautiful. Thank you for the giggle and the delightful cards. Hugs! I didn't think making cards was hazardous to your health but with all the stabbing and jabbing going on I have to rethink that! It's way more violent than I thought. I have had the handle of my big shot twirl around and hit me in the hand so I guess it could be. Now, on to the cards. Oh Darnell, you've done it again. Three gorgeous cards and oh that dragonfly card. I love the colors and design of it. The touch of gold on all three is just beautiful. These are so pretty Darnell and who knew tissue paper could produce such gorgeousness? I love the gold butterfly one... I have that die but as yet, mine is still a decoration and hasn't been used. It's a very pretty die though and I'll get around to it and hopefully make a card as gorgeous as yours. Your cards are so awesome Darnell. I'm glad you gave it a try. Stunning. Hope you are having a great summer. My Word Darnell...such fabulousness for a Saturday. Super Super cards. I might have to try that tissue paper thing...yours looks so lovely and I am intrigued. Love that you pulled out a brad or two or three I have a shload of them so there is hope yet. Happy Weekend. Wow! All of the cards are so awesome in every way. I love the tissue paper background you made and adding the gold elements was a perfect combination. Those are delicious colors too you used. And, the last one with all that gold is also an elegant and outstanding work of art. Thanks for sharing your designs. These are wonderful cards, and this is only the 2nd time I heard of the tissue paper technique, so now of course I'm going to have to investigate! 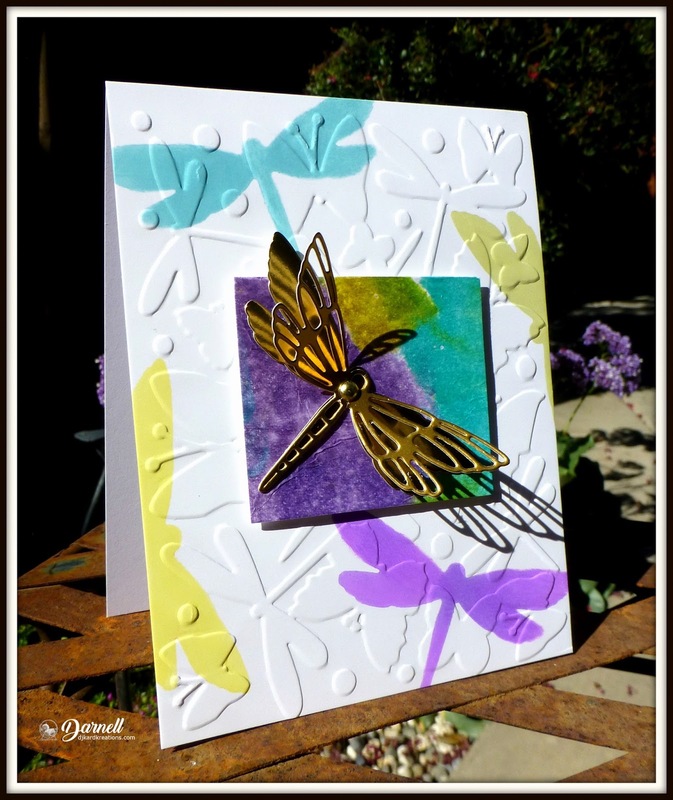 I love the gold touches on each card, and the butterflies and dragonflies are equally lovely! Have a great weekend! a gorgeous trio of golden deligts, Darnell! Kinda liking all that shiny stuff and the old school brads, or course. My brother Brad should take up some gold work - (smile). So many great inspirations in one post !! I love all the cards, but the last impression made on me is the greatest card. Great design, this card is incredibly beautiful and elegant. Gold, it was an excellent choice. Wow, I just watched that same video and have been getting inky all day too! I LOVE your cards and the colors you got with this technique - I love them all but I think my fav is the first one - love all that white with the colorful tissue paper - it really pops! Thanks for the fun and inspiration Darnell! Hugs! A fabulous array of card Darnell, the first one is my favourite , super colours on the lovely background, looks stunning against the white frames. Love the way you have stamped over the EF. Thanks to you I have another technique to try...as if I didn't have enough already. Checked out Lolls' video...now I'm itching to cut up some tissue paper. Though, chances are, my results probably won't touch yours. May I just say...WOW! (at the top of my lungs). You really gilded all your lilies beautifully. Sorry about the butterfly...lepidoptery has never been my forte. But what a card! Brutal though it was to make it. Beautiful cards! So unique and creative! A stunning collection of cards! The vibrancy of the colours is fabulous and the designs are amazing. Stunning photography. You are spoiling us with 3 glorious cards. The schparkly tissue paper on the first card is inspired. May just have to try that one. Hadn't noticed the maimed dragonfly until you mentioned it lol! Hope you are healing well. Oooh, bumped into pink haired Christine at a craft show last week. It was lovely to see her after our burger joint gathering last year. Hasn't time flown! Beautiful cards Darnell. I love this tissue technique. I love the acetate you have used, So pretty. Yes definitely golden delicious! All three are amazing Darnell, just beautiful! Your cards are really quite regal with all that gold! I love them all, Darnell. They're CAS but with lots of color and interest. Besides, of all the insects out and about, dragonflies are one of my favorites. Wow...Gorgeous tissue paper CAS design, Darnell for our CAS Mix Up Challenge...But there is more..3 more gorgeous cards. Each card is so beautiful with so many creative techniques, embellishments, etc and designs. TFS all your beauties my friend. Thank you for joining our CAS Mix Up Challenge too. Hugs..
Well Darnell this proves to me that you have a sadistic streak with all your stabbing and impaling (of course I would NEVER do anything like that!!). For all that your cards look wonderful. Love the tissue paper ones, especially with the gold added, and also the acetate (despite the violence). I do hope Hammy is safe!! Hi Darnell, Loving the cards. The Dragonfly one would be my favourite. Bootiful tissue paper cards but i'm not letting you any where near my acetate!. I shall, go and lie down in a dark room now to recover and take me acetate with me. Hugs lady Anne. You ahve been super creative! All three cards are gorgeous. I think my favourite is the gold butterfly. I sure do love your tissuey backgrounds with the gold, whether splattered, die cut, or impaled. Very pretty stenciled and embossed background on the dragonfly card. Wow x 3 today, Darnell! Wow, beautiful cards and great technique. It is also on my "to do" list, colours are just amazing. Ooh, three gorgeous cards, Dolly! Love the tissue paper samples! Isn't it fun? Also love all the gold loveliness's! Thanks so much for sharing with us at CAS Mix Up! These cards are stunning, Darnell. I love the three different looks and all the sparkly elements. TFS. Have a wonderful week. What wonderful use of the tissue paper! Beautiful colours and all that gorgeous gold! Thanks so much for joining us at CAS Mix Up! And your other cards are fabulous too! A fantastic collection of cards Darnell, I especially love the top card and the tissue technique. Very opulent with the touch of gold too. A plethora of beauty here, Darnell! Each card is a master piece of art work. I haven't yet tried the tissue paper technique but have been seeing it a lot recently. Your cards are inspiring! Enjoy the rest of your summer! Awesome! Awesome! Amazing cards...(must watch that video!) Brads? What's wrong with brads? I use them all the time! Fantastic cards you made. Just love those with dragonfly. Playing catch up after vacation! Lots of prettiness happening here on your blog while I was away Darnell. I love your fancy dragonfly card. And that little vase of tulips is as pretty as can be!! OMG Darnell ! What a gorgeous trio of cards ! I love them all ! May be the first one is my fav one, what a stunning and striking background you succeeded to do with Loll's technique ! Incredible how gorgeous it is with the addition of the gold dots ! Superb ! But the two other cards are also very beautiful and I love the golden acetate panel you've made. It is so delicate and sophisticated ! It's really an artistic trio that you offer us ! Thanks for sharing and for inspiring ! Wish you a wonderful rest of the week ! Hugs ! Wow, these are gorgeous cards, Darnell! I absolutely adore the first one - the bright colors and the dots of gold are so luxurious-looking. WOW, each one of these dazzlers is solid gold! Love the designs and tissue art and acetate, Darnell! I was away this week so I am going to have to look at that tissue paper tutorial. I adore the cards that you created using this technique!! The first one is my favorite with the gold touches!!! Your third card-acetate? I think I need to pull the stuff I have out now!! I LOVE the effect!! I hate adhering it myself to a card and usually don't wind up using it unless I make a shaker. Great design!! I'm so glad I stopped by...not just to see your beautiful 'threefer' but I always enjoy reading your posts ~ A landing strip for a dragonfly? You are too funny, Darnell! You did an amazing job with this technique! I love all three of your cards, but I am partial to the first one with all the gold Delicata ink that you added to your design...so beautiful! I hope your week is off to a great start ~ Sending hugs and thanks for all of your lovely comments on my blog...You're the bestest!! !